Description: BNSF Yard Limits - BNSF Beardstown Sub. Description: Pumpkin power sits to the side as classic BN power puts together the A&M cars before heading east with the local. Description: Two GP39 type locomotives book it east out of Monett with the Monett local. Description: Eastbound LIN LIN Train. Description: BNSF local at Fremont. Description: BNSF's Fremont switcher idles into the evening. Description: Local power tied down near the BNSF depot. Description: A Geep in BN paint sits in BNSF's large intermodal facility at Cicero. Description: Shut down for the weekend in the Cleburne Yard. Note the class lights are still intact on the nose of the lead GP39-2. Description: A GP39-2 on a manifest freight? BNSF must be experiencing a power crunch. Description: I can't remember the last time I saw a 39-2 in Fort Worth. Description: Cascade Green power is becoming harder to find. Especially with high mounted headlights. Description: A Cascade Green GP39-2 waits for a crew to take this train to nearby Alliance Yard. Quite a lashup! 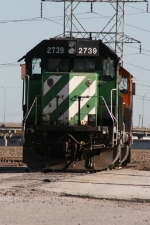 Description: Two Geeps in Burlington Northern Cascade Green have the afternoon off in BNSF Midlothian Yard.